At some point in time a freelancer was considered a rebel–someone who went against the rules of corporate America to find income from other sources. In fact, some could argue that it was a little silly to become a freelancer because the work wasn’t all that profitable and not many employers thought about reaching out to freelancers who wouldn’t be salaried workers. That’s changed quite a bit over the years, seeing as how reports state that over 54 million Americans are freelancing in some fashion. The trend continues to grow, and you can owe it to the fact that technology is allowing for more work at home jobs. Not to mention, many people are finding it difficult to find reasonable office jobs, so they are almost forced into the freelancing world. Regardless of how you become a freelancer, or what services you sell, the point is clear: Freelancers are continuing to become a large part of the global economy. So, what are you to do as a freelancer? The competition is growing more fierce, so a website is a must. You’re going to want a platform that shares your thoughts while also bringing together your past work to show potential employers. We like the idea of themes that combine blogs, portfolios, and informative tools. For example, it’s not a bad idea to have a slider with testimonials and links to contact forms. As freelancing grows throughout the world, more WordPress themes for freelancers are going to arise. 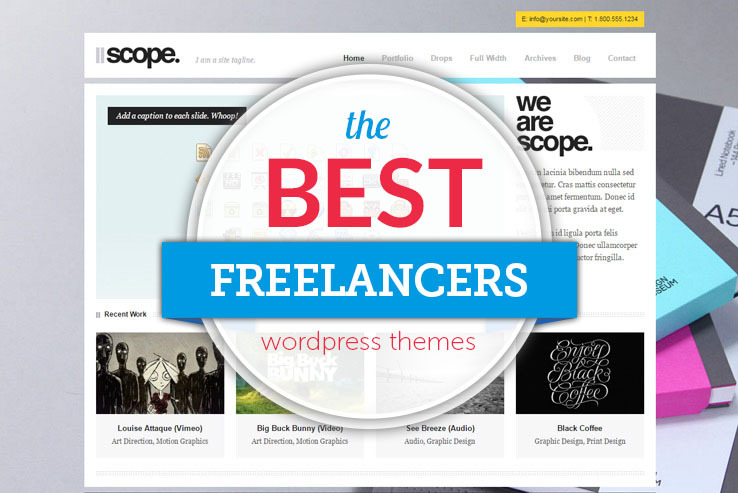 We’ve done the work for you and compiled the top WordPress themes for freelancers, hopefully cutting down on the amount of work you’ll have to do. 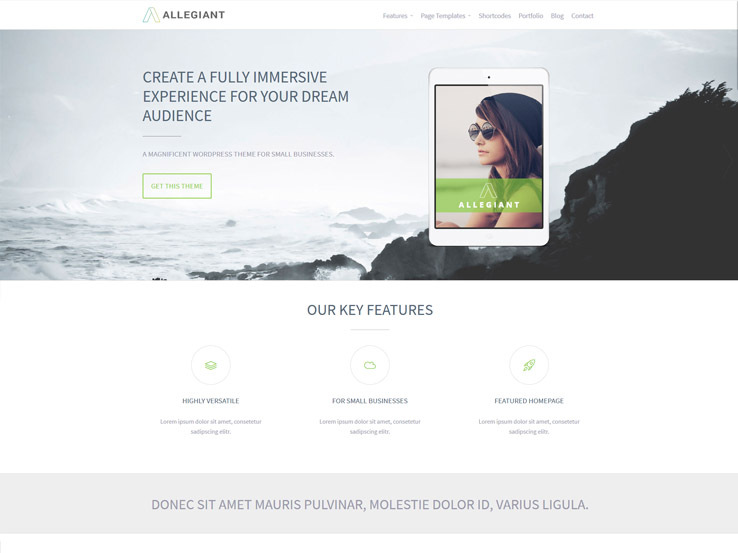 The Allegiant theme is a great template to start us off considering it comes with a clean and professional design, along with an impressive set of features to supercharge your freelancing career. It includes several useful modules such as a featured section to present your services, a portfolio to showcase your previous work, and testimonials to build your reputation and credibility. You website will look great even on mobile devices, and you can display it in your preferred languages since this theme is multilingual. Use the blog to share your knowledge, attract people to your website, and grow your clientele. Besides, the Allegiant theme comes with a nicely done contact page for people to easily get in touch with you, and social media integration to help spread word about you and what you do. You’ll also find lots of customization options to make the theme yours. You can easily upload your own logo, change colors, fonts, and layouts to match your style. Freelancer is a responsive one page WordPress theme developed by ThemeFuse team. This template is dedicated to freelancers, web designers and developers and other individual professionals. This theme has a fresh and modern design that allows you to present your services, portfolio, blog and all the information in one a single page website. Some of the key features Freelancer includes responsive and retina ready, unlimited color options (easily change textures and background image from the backend), animation effects, sliders, one-click install and much more. 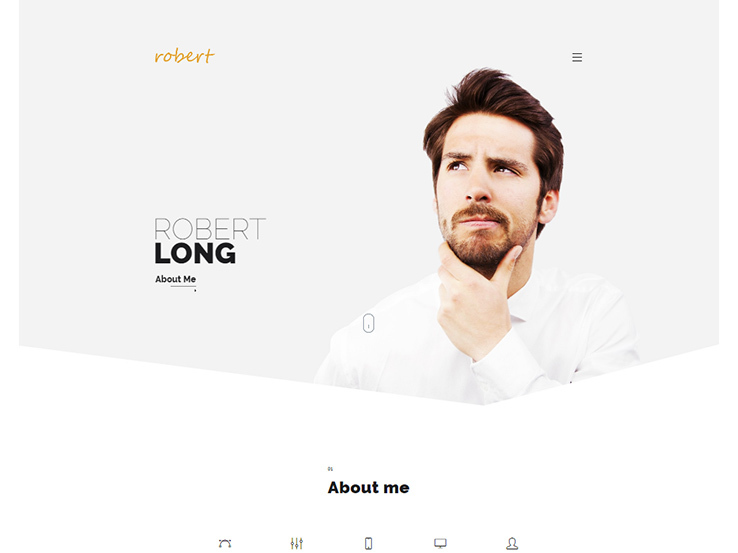 This minimalist and powerful theme will definitely make your personal profile stand out. Freelancers are a particular type of professionals who especially need a website. They can use a website to display their portfolio, skills, services, contact, and other relevant information in a single location. 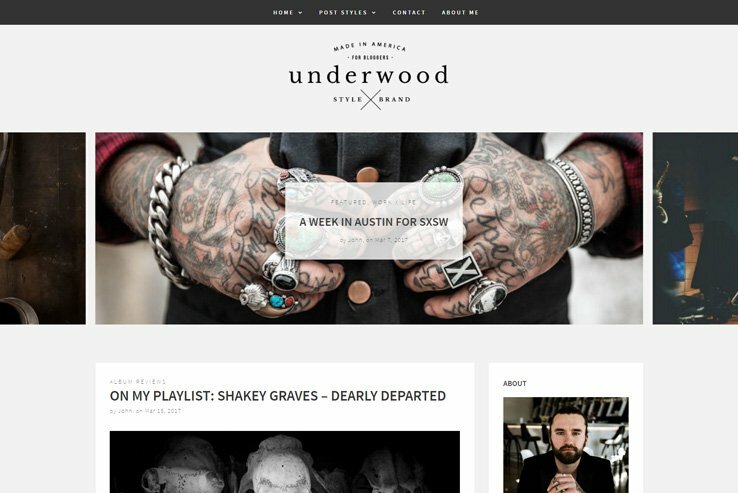 Underwood is a specially developed WordPress theme that can help in all these areas. The blog-centric design also allows you to provide a detailed explanation about your skills, previous projects, and the services you currently offer. Underwood supports several post formats to help you publish blog posts and present information in interesting ways. As it comes with full support for WooCommerce, you can sell services and accept payments right from your website. 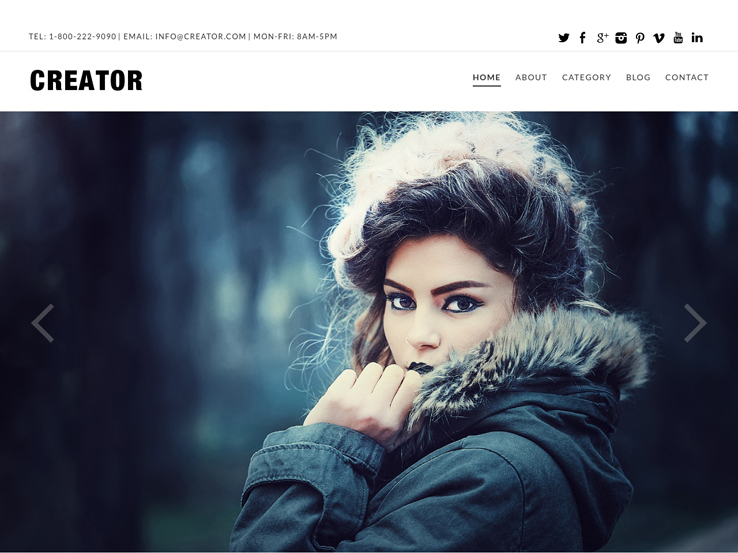 You will find lots of styling options at the theme customizer section. You can choose your own color, pick any font, or make any other customizations, and check out previews at the same time. Features like clean coding, following the web best practices, and support for popular SEO plugins will ensure that your website gets the maximum exposure on various search engines. To start off, we have the Balanced WordPress theme from Press75. It’s a minimalist and stylish theme, with responsive design and a focus that brings eyes towards the middle of the page. Plenty of white space is provided, so we think it’s a theme that works best for freelance writers. That’s not to say that photographers, designers, and other freelancers won’t find this appealing. The theme has various widgets for placing all over the home page, sidebars, and footers. As an example, you can insert categories, tag clouds, and navigation, all with the simple dragging and dropping of a widget. You may not use advertisements much as a freelancer, but you have that option with widgets. The only time we could see a freelancer implementing ads on a site is when they have a blog with lots of followers. In addition to these widget options, the social media tools are great and they prevent the need to have third-party social media plugins. Therefore, you can keep your site faster and more secure. Another interesting part of the Balanced WordPress theme is that it’s designed to support videos. So, if you’re a videographer or you want to show that you can make all types of content for your clients, feel free to upload high-resolution videos from places like YouTube and Vimeo. The shortcodes are useful for building quite a few different elements. You can make a button or column, without the need to touch a line of CSS. If you’re a beginner, shortcodes should become a large part of your workflow. Even advanced users like these shortcodes because of their ability to speed up the design process. 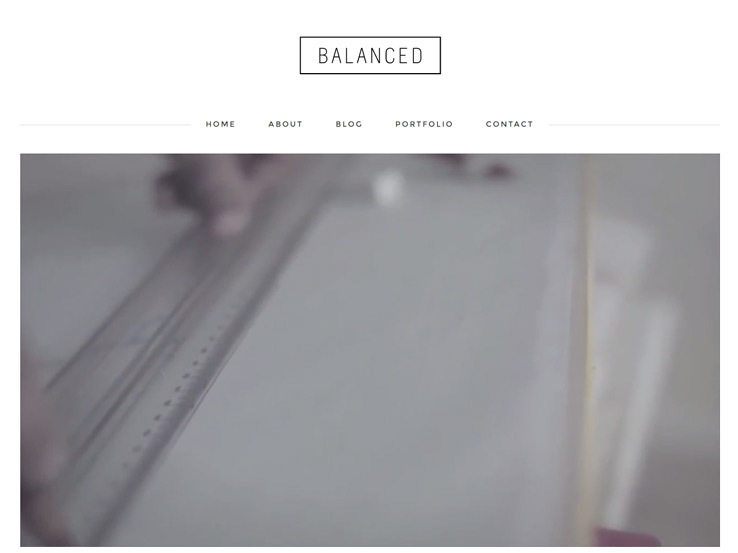 The Balanced theme has a design with a centered logo, menu and content feed. All of your blog posts include large featured images, which are great for maintaining a more visual take on the standard freelancer’s website. Along with sample content, Photoshop files, and translation tools, the Balanced WordPress theme is one of our favorites for freelancers from all industries. It wouldn’t be a list without a mention of a theme from the Elegant Themes library. They actually have quite a few themes that look nice for freelancers, but our top choice would be the Flexible solution. It offers a sleek and minimalist layout, which we recommend for writers, photographers, and designers. The whole goal with the theme is to put your work first and to remove all the bells and whistles you would find on other themes. You know, the stuff that clutters your site and makes it tough for people to find the content they want. We like it for the more visually-based freelancers because the portfolio designs are completely focused on the multimedia. So, if you had a bunch of website designs or photographs, it would only take a few moments to upload each one and see them organized professionally on your homepage. The modern style is a huge bonus, but one of the standout features is the AJAX loading media gallery, so your users will not have to wait around to see your past work. This benefits you as well, considering a potential client is not going to sit there for a slow loading website. The gallery has sortable settings, so users could come onto your website and easily find examples of your previous work that relate to their project. Complete localization is helpful to translate your website and potentially work with clients from all over the world. The font customizer and the unlimited color schemes are a great starting point to establishing your brand. Keep in mind that the Flexible WordPress theme has a completely responsive design which means your website will look great even on a smaller device, like a phone or tablet. The theme options are all managed on the backend and it’s pretty impressive how organized they are. As a freelancer, you want to spend as little time on your website as possible, so this puts you right back on track with helping out clients. Most freelancers don’t want to spend time with custom CSS or HTML. Therefore, page templates and shortcodes are packaged into the Flexible theme so that you don’t have to mess with that. Creator is a great choice for anyone who wants to stand out from the competition and put their past works in the center of attention. 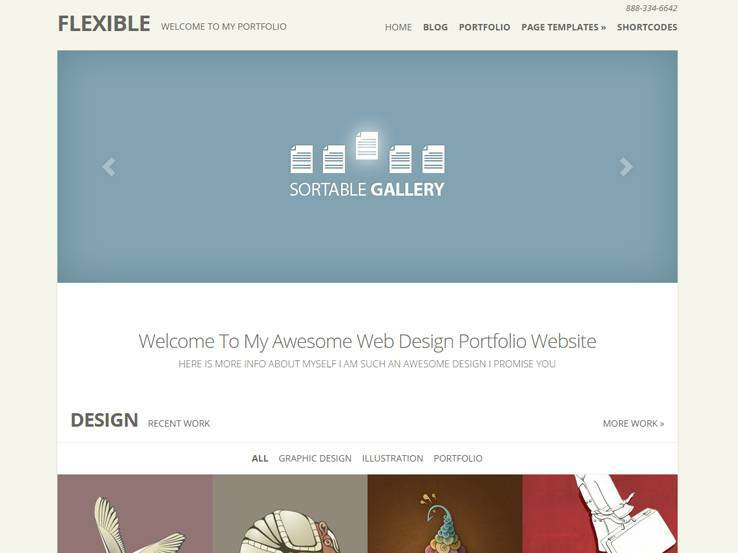 The homepage layout is highly-focused on showcasing your portfolio. The very top of the page has a very minimal bar with your contact information and a place to include your social media icons. Directly below, you can upload your own logo and include an elegant yet unobtrusive menu. The header area is occupied by a stunning full-width slider and the area below has an interesting grid-layout featuring even more photos. Add your blog posts below and provide company information or a call to action in the footer. The theme options panel is easy to use and allows you to customize the look and feel of your website. Creator has been SEO optimized which ensures your website will be easily indexed by the search engines. It’s also cross-browser compatible and has a responsive, mobile-friendly design. Should you need any help with the setup, you can always refer to the helpful documentation and theme video overview. 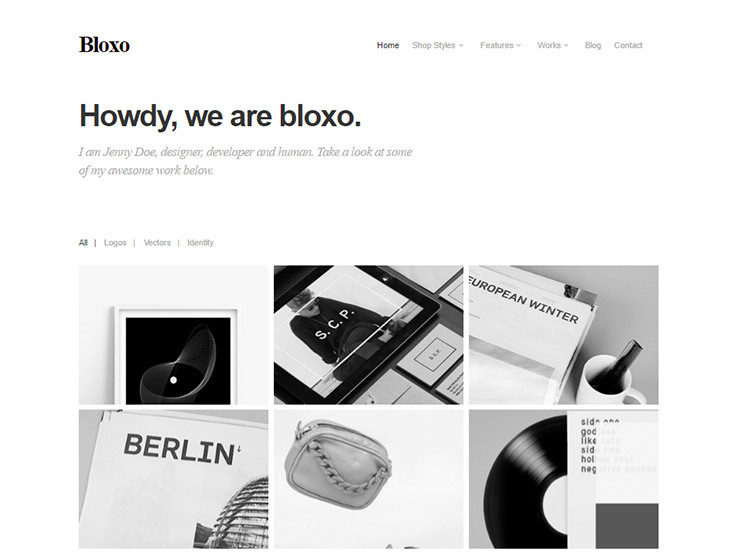 Bloxo is a minimalist portfolio theme with plenty of features on the backend. The homepage eliminates virtually any and all distractions by letting your portfolio occupy most of the page. The top area allows you to include a brief welcome message, followed by a grid-based layout of your recent work. The layout of the portfolio can be changed to masonry, classic, or any one of the various templates that come with the theme. The portfolio is filterable which makes it easy for potential clients to find the work relevant to their needs. Aside from the portfolio, you can include logos of your previous clients and your social icons in the footer. A notable feature of Bloxo theme is the integration with the WooCommerce plugin which allows you to turn your website into an online store. You can also take advantage of the WPML plugin to translate your website and attract international customers. The theme options panel allows for plenty of customization in terms of colors, fonts, icons, and more. Include a custom contact form to increase the number of inquiries and add a blog page to share design tips with your audience. Finally, the Bloxo theme is completely responsive, SEO optimized, and has beautiful animation effects to create a website that truly reflects your style. It’s Me is a unique portfolio theme that can be used as a one-page or a multi-page theme, depending on your preferences. The theme has 4 different layout variations to choose from. The default layout immediately grabs the attention of your visitors with a large header image. Use it to include an image of your latest design or your personal photo and add a text overlay to drive people to other areas on your site. The menu has been minimized completely and has a nice animation effect when revealed. Include all the services you offer, add snapshots from your portfolio, show a list of your latest blog posts, and even present a nice graphic overview of your design process so your clients know what to expect. Change your fonts, colors, and more through the theme options panel which is very intuitive and easy to use. Create an unlimited number of custom layouts with Visual Composer and use the shortcodes to add more complex elements such as buttons without having to touch a single line of code. 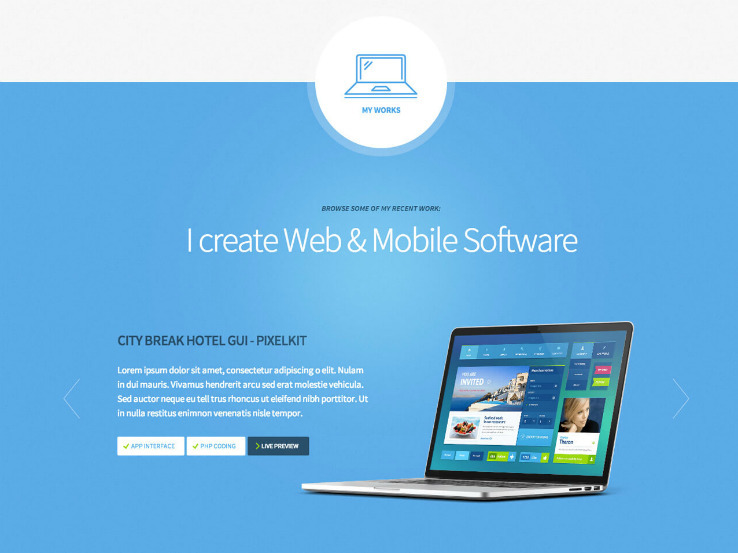 The theme is fully responsive and is sure to impress even visitors on mobile devices. The Jarvis WordPress theme comes into play if you’re a freelancer that also wants to set up an online store. It combines well with the WooCommerce plugin, meaning that you can sell digital and physical products and collect money through a payment processor. The Revolution slider works well for showing what your services are and it can link to other parts of your website. A contact form is already built into the theme and connection with your clients are even easier with social media integration and MailChimp support. Oh yea, and you get unlimited skins to brand your site the way you want. 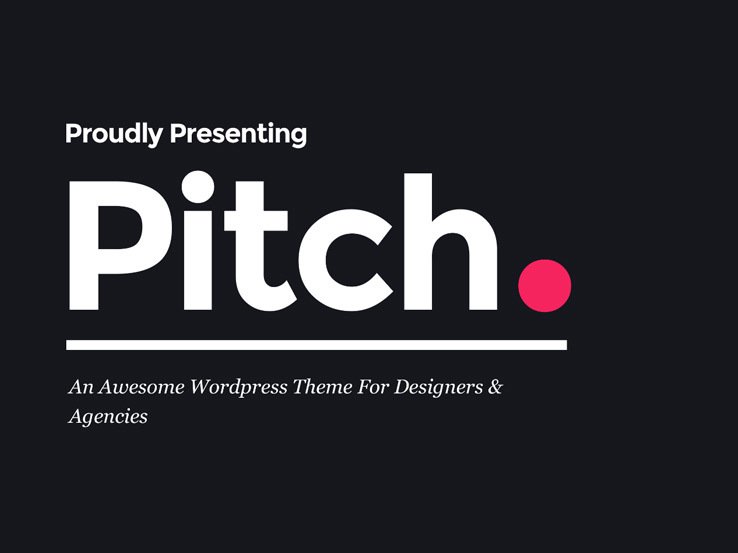 Consider the Pitch theme for your freelancer site if you enjoy unlimited possibilities with your WordPress themes. We understand that this is not the case for all webmasters, so it’s important to understand if you’d like more features packed into your theme or a simple interface like the one we talked about above. If you’re looking for unlimited customization, the Pitch might just be for you. The modern and responsive layout is sure to grab attention and look good on smaller devices. The wide variety of layouts helps several types of freelancers. General business freelancers could make a site, while writers, artists, and other creatives have options for their business services as well. The inspiring portfolio layouts are some of the more creative we’ve seen, especially considering most portfolio themes leave you with only a handful of options for rows and columns. The Pitch theme, on the other hand, really grabs attention with interesting portfolio setups. 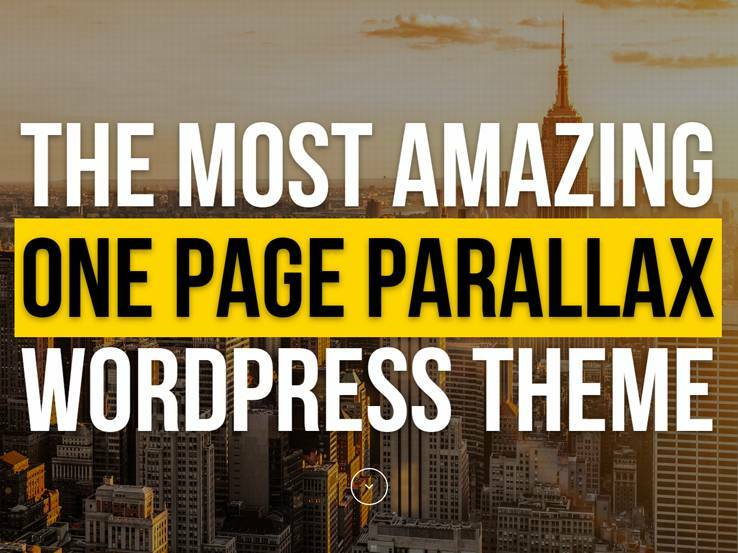 The powerful options include parallax backgrounds and sliders towards the top of the site. The slider supports video or images and the font and menu animations are fun for connecting with your customers and showing them around your website. The default header takes up all of the screen giving you an opportunity to announce what the site is all about. You can then show your portfolio, regardless of the portfolio layout you select. Then, it lets you alternate between different content rows. So, if you’d like a call-to-action or a testimonial in one of the rows, it’s completely feasible. Although this is not a one-page layout, it certainly works like one. The innovative menu types are worth checking out since they allow you to really stand out from the competition. Going back to the introduction of the theme, you’ll get plenty of customization opportunities with the Pitch theme, so if that’s what you need, pull the trigger.